Build a Fall Cheese Board. I picked up the most amazing herbed cheddar cheese at a local farm store this morning, and came right home with it and a loaf of bread to make myself some savory grilled cheeses and soup for lunch. I opened up the cheese and bread to just have a little taste, and completely abandoned my lunch plans. We had no need to make these tasty ingredients into anything else, they were perfect just the way they were. After my impromptu cheese-plate lunch, I thought I’d share some of my favorite tips for building a beautiful and balanced autumn cheese board. It’s one of my favorite tools for entertaining! Start with a big base! 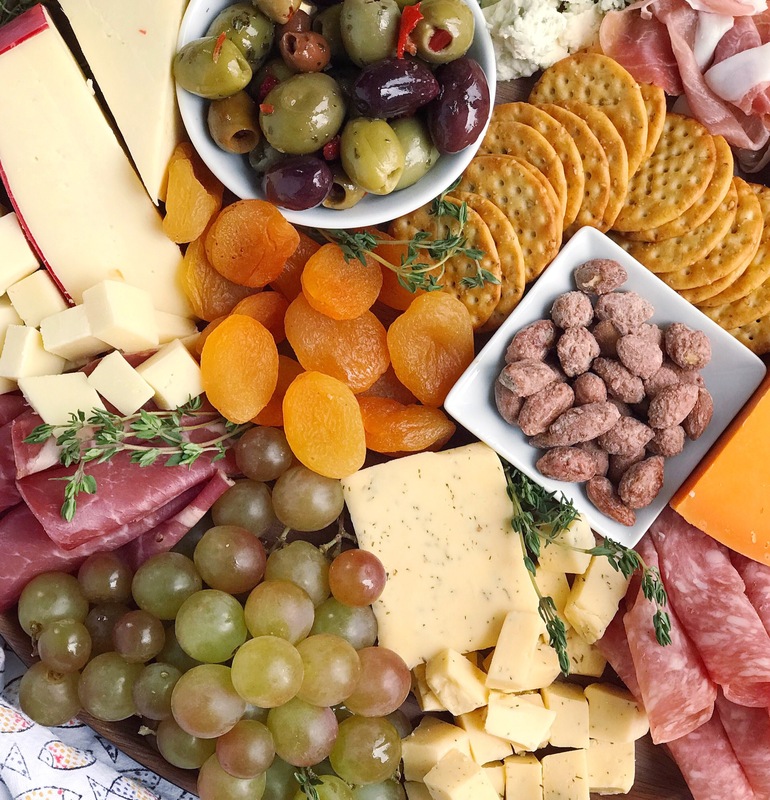 I love using my large marble pastry board, because it creates a big sturdy surface on my living room ottoman, and more importantly it retains cool temperature and keeps the cheeses and meats from warming up too quickly in a room full of guests. For fall though, I also love a big butcher cutting board for a more rustic, warm look. The hardware store is a great place to look for surfaces – like scrap slate, marble, or butcher block for your snack board. Make your cheese selections. Every article you read about building a cheese plate will tell you to balance your selection with one hard cheese, one soft cheese, and one crumbly cheese, like a blue cheese. I’m here to tell you to ignore that rule. A perfect cheese board has whatever kind of cheese you and your family likes! Start with approachable cheeses, like sharp cheddar and a creamy Brie or Camembert. Then add in one or two more cheeses that might be a bit more flavorful or adventurous. A goat cheese rolled in herbs or seasonal dried fruits can be delicious. Manchego, Gouda, Havarti, and Gruyere are a few of my other favorite cheeses that I use often when entertaining. Something sweet, something salty. Once you have your cheeses selected, add in a few salty ingredients to your board. I love a selection of charcuterie – like peppery salami, thinly sliced pieces of prosciutto, and spicy pepperoni on a fall cheese board. Another route for adding saltiness to your cheese board is through a variety of nuts; fill some small bowls with your selection of nuts and nestle them onto the plate in between your cheeses. To balance the saltier components of the cheese plate, add a few sweet elements too. Dried fruit is a great way to add color and texture, and a sweet apple or pumpkin butter to spread on cheese and crackers is the ultimate fall cheese board addition! Don’t forget the carbs. Some carb-vehicles for your cheese are an absolute must! Fill in the plate with a selection of crackers, breads, and toasts in a variety of sizes and textures. I like to pick at least one or two crispy crackers and balance them with a softer element like a fluffy baguette or pita toasts. The final touch. The key to finishing off your cheeseboard like a pro is with garnishes. Drizzle one of the softer cheeses with local honey and tuck in fresh green herbs like rosemary or thyme for a pop of color and aroma before serving. At the holidays you could even nestle in some cinnamon sticks or crumbled bits of dark chocolate for a sweet finish. New England Invite Book Tour. A Bedding Refresh. One Response to "Build a Fall Cheese Board."